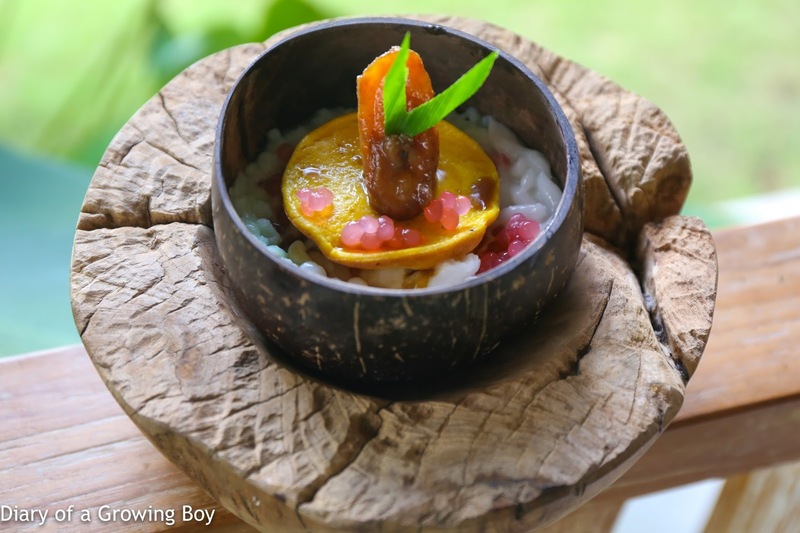 吃喝玩樂 - Diary of a Growing Boy: Bali hop 2017 day 2: the best in Jimbaran?! Bali hop 2017 day 2: the best in Jimbaran?! We woke ourselves up at an ungodly hour this morning when we should have been enjoying our huge, comfy bed in our villa. Hello Kitty wanted to catch the sunrise, and she forgot that we're here in the rainy season... and the clouds take a while to dissipate after thunderstorms overnight. I also forgot to mention to her that the Ayana Resorts and Spa faces northwest... Anyway, we dragged ourselves out of bed, walked around the grounds of the resort, and quickly gave up on trying to catch a glimpse of the sun. Nap time in the poolside gazebo. We did drag ourselves up again for breakfast, and it was just a few steps to DAVA Steak and Seafood - where we were seated outdoors with a view of the koi pond next to us. I was pretty surprised when I saw kouign amann in the pastry tray that was brought to us, and I felt obliged to try one. 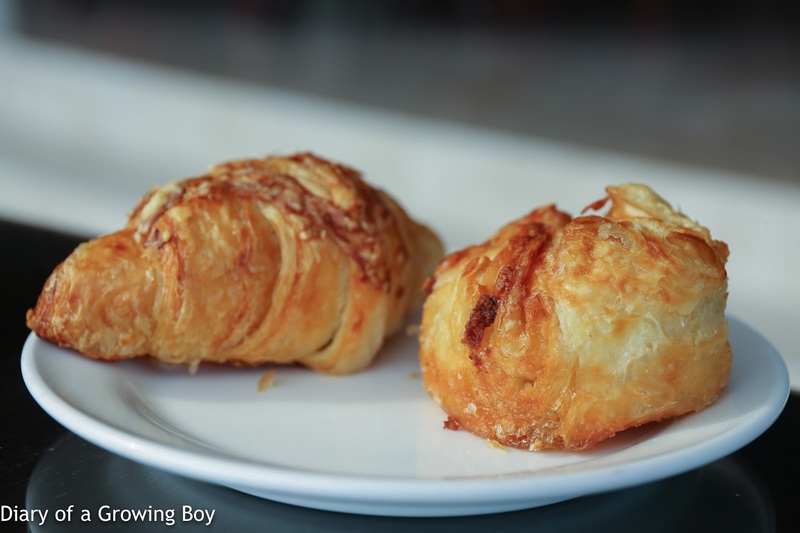 This isn't an easy pastry to make, and the one I had wasn't bad at all. It may not be as good as what the Great One makes at home or Dominique Ansel's famous DKA, but given that we're at a resort in Indonesia, I was pretty happy with it. I looked over the selection of breakfast items, and there was a dearth of Asian dishes that sounded interesting to me... 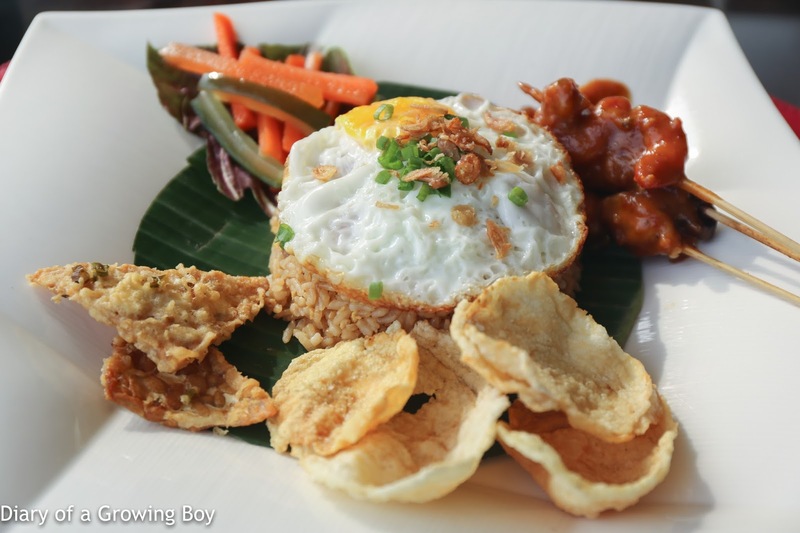 So I ended up with the ol' nasi goreng. Pretty much par for the course for an Asian resort. We also got ourselves a fruit plate. 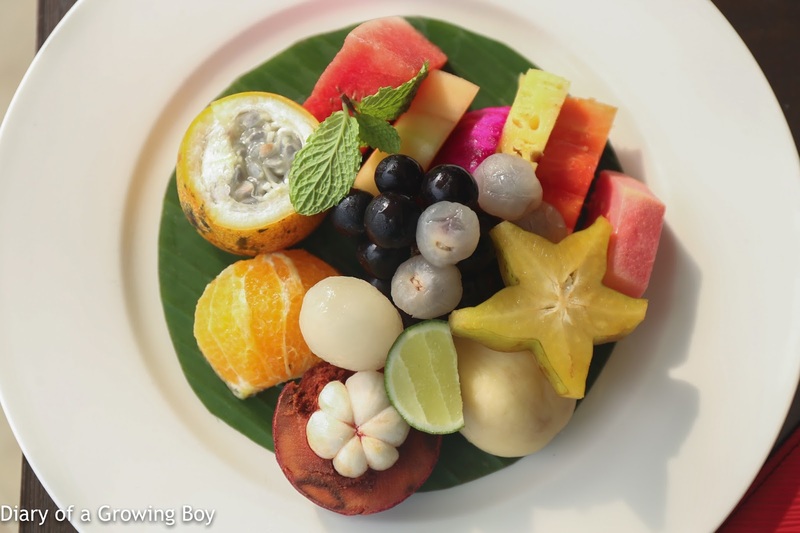 This was no ordinary, boring plate with only 3 or 4 varieties... there were a whopping 13 different types of fruit on the plate - including some of my favorites like Balinese passion fruit, rambutan, and mangosteen. Our driver came to pick us up to get us to a couple of places I planned to hit today. First stop was Pura Tanah Lot. I'd been to the temple a couple of times, but this time I brought my new toy along. That turned out to be a pretty fun morning. We arrived just before 2 p.m. and the place was pretty empty by then. The decor was pretty nice, although the lighting indoors was pretty poor. For some reason the tables were all placed in between windows, which meant that sunlight wasn't able to illuminate the dishes in front of us. This was pretty annoying. Kunyit asam gula madu - I wanted to check out a traditional drink featuring palm sugar, but this turned out to be too exotic even for me. 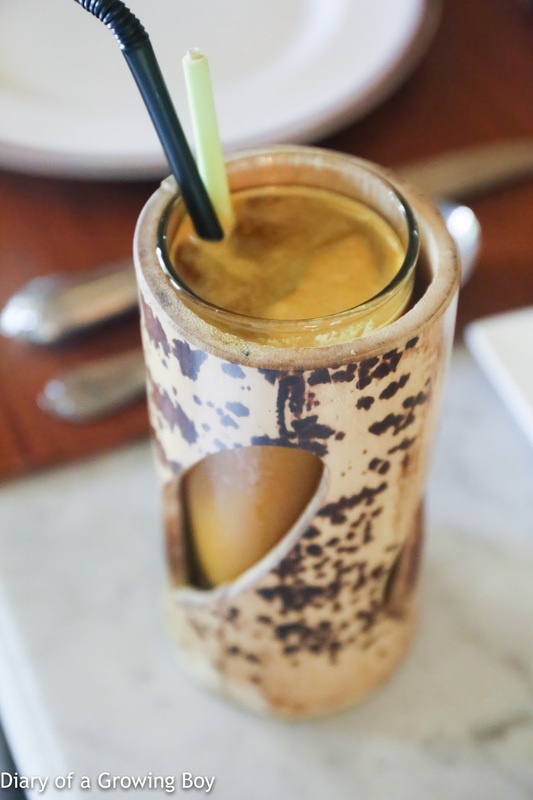 The mix of turmeric, ginger, and galangal was too heavy-handed and the flavors ended up clashing... and any sweetness from palm sugar was wiped out by the combination of tamarind and lime. I took a couple of sips and gave up. 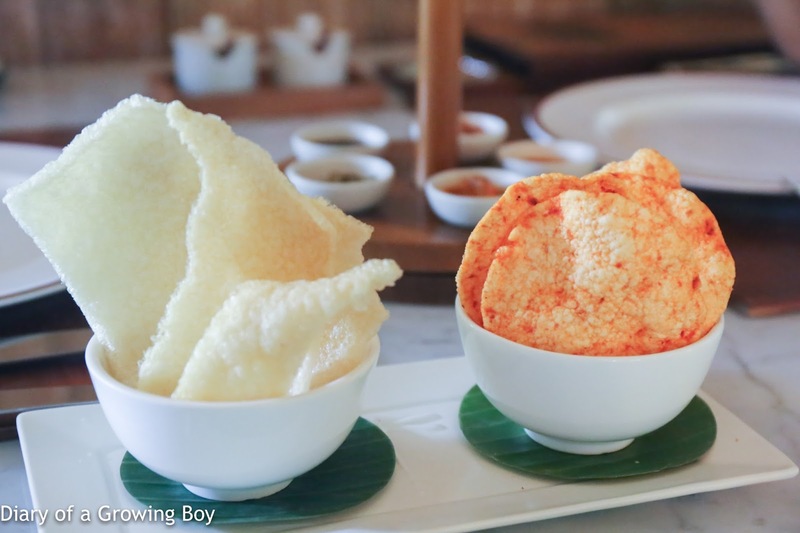 The two types of krupuk were made from rice and potatoes, and came with 5 different dips. The plain ones made from rice were, well, plain. 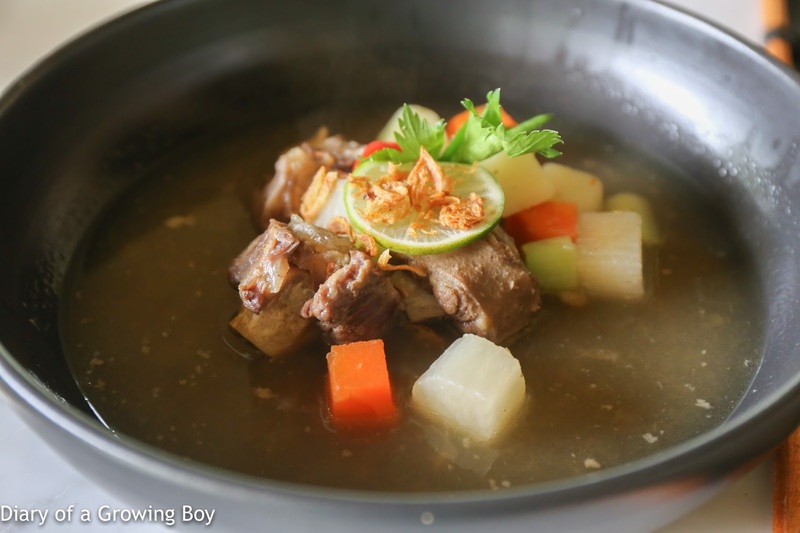 Sop buntut - oxtail soup is a staple of Indonesian restaurants overseas, and this was pretty decent. The oxtail meat was pretty tender, and we could taste the nutmeg. It's a shame, though, that the soup came only lukewarm. We were hoping that it would be piping hot. Bebek betutu - a Balinese classic, and this was pretty good. The smoked duck was very, very tender, and the flavors were satisfying. The vegetables on the side were pretty tasty, too. 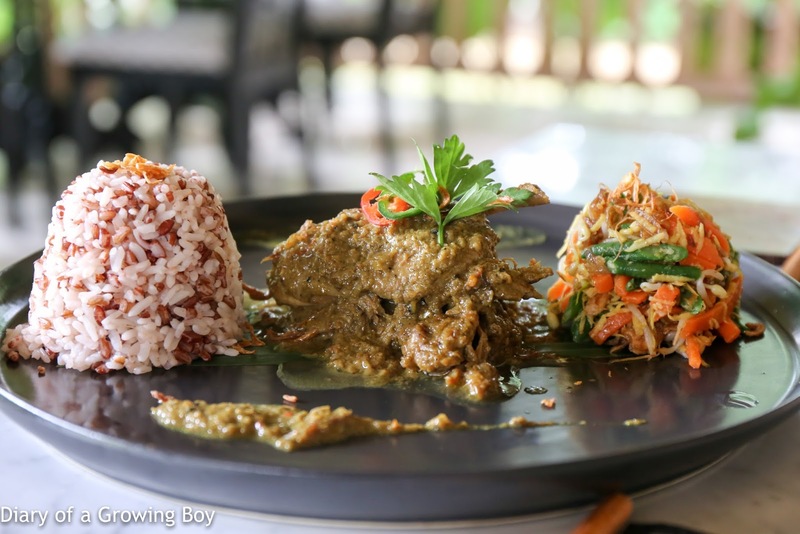 Rendang sapi - I always want to try out rendang wherever I go, but I usually end up disappointed. And so it was today. The beef was tough, dry, and chewy - like so many other Indonesian restaurants. I do wonder if they prefer their beef this way... or they're just so used to eating working oxen that they don't crave for more tender beef. 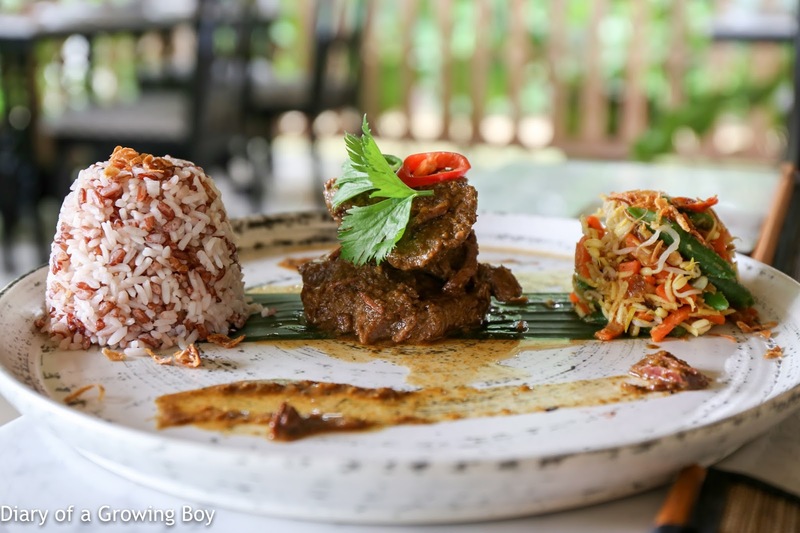 I guess that's why I love Candlenut in Singapore so much, because Malcolm Lee will use things like beef cheeks, French duck breast, and even Australian lamb shank in his rendang. I had room for one dessert, and just had to have cendol ngangenin. I was a little surprised, though, when the jelly came looking white instead of the usual green. Aside from orange-looking tapioca pearls, there was this thin, flat piece of unremarkable floury thing that I could only assume to be "mud cake"... although it tasted nothing like any mud cake I have ever had. The small piece of banana on top was OK, and though I could recognize the faint jack fruit flavors, there was no trace of the ice cream that was mentioned on the menu. Overall, a very unremarkable lunch. This basically reaffirms my view of restaurant reviews on TripAdvisor... or most crowd-sourced review sites. Most of the reviewers simply don't know enough. What we had were ordinary and I'd be really surprised if this place really was "the best in Jimbaran". The service was also excruciatingly slow, especially for a restaurant that was practically devoid of customers. No idea why it had to take over an hour for us to do lunch here. Bangkok 2017 day 3: Le D'oh!